The harvest at the center of Lisa Rosenthal’s new work premiering at Polarity Ensemble Theatre March 25th is not one of wheat, soy, or fruit – it’s one of children conceived using in vitro fertilization. When central character Joan of The Good Harvest finds herself desperate – caught between the reality of several miscarriages and her own obsession with a lost child she considered “her destiny” – she and her husband Davis embark on a too-successful fertilization that results in a high-risk multiple pregnancy. Shown in flashbacks and flash-forwards between Joan’s life and the lives her surviving children, we learn of the deaths and the guilt that haunt her. Rosenthal is aware of the likelihood of a real debate following her fictional ones, but is quick to emphasize this is not inherently a “topic play.” Its inspiration, from the “what-if” scenario, has evolved into a rich character portrait of Joan, her neglected children, and their distant father. “So many women have faced infertility issues during their lives that many women will be able to relate to the hunger and drama surrounding Joan and Davis’s procreative choices and emotional dilemmas,” predicts Rosenthal. Rosenthal is thrilled to be working again with Chicago’s Polarity Ensemble Theatre, hot off a successful run with A Streetcar Named Desire and named “Best Emerging Theatre Company” by the Chicago Reader in 2008. 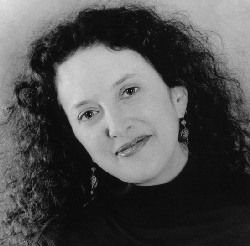 Rosenthal herself is two-time participant in the long-running Dionysos Cup, a festival of new plays presented annually by the troupe. 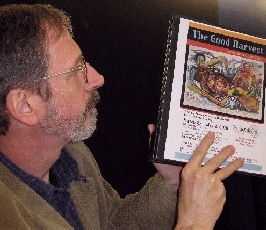 In fact, The Good Harvest took home the 2008 prize. Chicago playwright Rosenthal has been a recognized name in the Chicago theatre scene for years, particularly because she founded the Vet Art Project (www.vetartproject.com) and is a resident playwright at Chicago Dramatists. Her plays have been produced in several parts of the country and she is the recipient of several playwriting awards and fellowships including an Illinois Arts Council Special Assistance Grant for the development of The Good Harvest, and a Puffin Foundation Grant and Illinois Humanities Council Grant for the Vet Art Project. Artistic Director Richard Engling will direct the production of The Good Harvest. It's time for a celebration. Don't let us drink alone! We spend a lot of time head down, working, enduring through the days. Once in a while something comes along worth celebrating. I am really looking forward to March 26th, the Premiere Night for The Good Harvest. All the people who’ve supported Polarity truly have something to celebrate that night. Your support, whether though good wishes, work, donations or attending our past shows or events, has made this culmination possible. You have helped create the environment that enabled Polarity to bring together the ensemble of actors, directors, designers, dramaturgs, volunteers and workers of every ilk who have collaborated with playwright Lisa Rosenthal to perfect her script and bring it live to our stage for its world premiere. The Good Harvest came through many revisions in the Dionysos Cup process and many more after it was chosen by the company for a full production. I am very proud of that process, and I’m delighted to have led the production with such talented actors and designers. I hope to share the moment of triumph with you, when we raise a glass after the show on March 26th. Ann Keen is organizing the party for post-show Premiere Night. We’ll have food from the Birchwood Kitchen, Chicago, and Noodles and Company in Evanston, as well as beer and wine and other beverages. And we’ll have the great joy of standing together at the launch of a significant new play onto the Chicago theatre scene. It’s a great pleasure to stand together at moments like that. I hope you can join us. I look forward to being there with you. Posted in From the Ensemble | Comments Off on Celebration!! I’m engrossed in the concept of time lately. Part of it is my own aging and having an increasing number of the important people in my life dead. As we work on The Good Harvest, I’m also writing a play about the legacy of two of my dearest friends, both artists, one a fiction-writer and the other a visual artist and former actor, both of whom died without their work being much recognized by the outside world. What does that mean? I’m drawn in to thoughts of why we do this work. In my own work as an artist, I’ve gone through long cycles of moving from one form to another. I first worked and trained as an actor, then a playwright and a fiction writer. When you work as a performer, time moves quickly. Your art exists in the moment, and then it’s gone. By the time I was in my thirties, I’d shifted to novel writing and spent decades always working on one novel or the next. To satisfy my need to perform, I played jazz drums. My novels took years to write. As a novelist, it feels like you are building something large and permanent, like the pyramids. You imagine your works sitting on shelves hundreds of years from now, next to Dostoyevsky and Faulkner. (Well, you imagine that when you are a young writer anyway). For this past decade I’ve been back working in the theatre: acting, directing, writing plays and adaptations, founding and running a theatre company. Why do we do this work? Will it matter after we are dead? Does anything matter after we are dead? Is it my novelist side that draws me to thoughts of legacy? I first conceived of the play I am writing as a tribute to my friend Fern. Even in the moments before she died, before she killed herself, Fern regretted that she would never write a novel she had planned. On the day he died my friend Dean was talking about making arrangements for some of his artwork—different arrangements than the way he’d left it in his will just a week before. Do they care now about the legacy of their work? Will anything I write change it? Does legacy matter? Or is the only thing that matters the way we live our lives moment to moment? As artists, we answer a vocation. For most of us, there is something of a vow of poverty involved. Because we devote so much of our time to a pursuit that pays poorly (or not at all) our finances suffer. But we find a value in it. We work at other jobs during the day and give up our nights and weekends to rehearse and memorize lines, design, build and plan. And when the project feels worthy, it feels like a privilege to be involved—even if we spend more on gas or public transportation to get to rehearsals than the pay the project offers. And when it’s over, all that remains are the memories. “I, myself, have struggled with the idea of legacy. This has been going on for years with me. Wondering if any one thing would be remembered after I am gone. Though I have never hit the level that I had dreamed of, or made an addition to society that is recognized, I do know that my legacy exists. I learned early in life that being true to yourself is a legacy. All of my adult life, I’ve witnessed people living with something missing or not enough of something. Sometimes it was as simple as not following a dream, other times it was living with the question of themselves being ”enough” or doing what they do for guilt or necessity or just being ordinary. My father was a wonderful man that was hard working, poor, uneducated and a bit stubborn on some subjects. I could talk for hours on what he did accomplish or overcame, though the rest of the world doesn’t know he even existed. His legacy was simple. A simple man who didn’t need or take a lot but gave everything. He was the epitome of a good man. When he died I knew the world was different for me. At his funeral I discovered his legacy was bigger than what I even imagined as in the evidence of each person that came to honor him and reveal a personal story about him and/or a shared event. The word used to describe my father by each person was simple. It was the word good. The actor asked to remain anonymous for the moment, but I want to give my thanks to him for allowing me to share his words. And we all look forward to sharing the fruits of our work with you in The Good Harvest. In the next stage of rehearsals, we get the play on its feet. We’ve delved into each scene intellectually and emotionally, focusing on the nuance of every word during the table work stage. Now we start to get physical. Each day before rehearsal, I spend a couple hours reading and rereading the scenes we will work on that night with the set design and floorplan at my side. I’ve already got notes jotted here and there in my script, but now I go over it again and make decisions about how I think the scenes should look and how the actors should move. The Good Harvest is a play about relationships. What moves the actors around the set are their emotions more than their need to accomplish tasks. For instance in one scene, Davis arrives at the house where the triplets are mourning the loss of their mother after the funeral. Davis is their father, but he left when they were infants. They have no memory of him. When we did the table work on the scene, I got the image of a pack of dogs circling and attacking the old alpha male who has returned. That was the image that inspired my initial blocking (the movement that actors make around the stage). Another scene takes place in the past, with Davis and Joan (mother of the triplets) when they were young. Davis and Joan struggle with making their marriage work. In charting their movement through the scene where they become closer or further apart, I created blocking to match their emotional state. In every case the pre-blocking I create on my own is our starting point. I describe the blocking to the actors at the top of the rehearsal. They jot it in their scripts. We discuss it. Then we try it out. And then begins the active collaboration on our feet as the actors work the scene in movement. We find ways to improve the initial blocking. 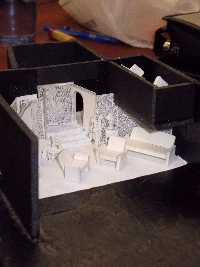 We rework the scenes again and again and make many discoveries and choices on the way toward the final shape of the play. Along the way there are moments of both frustration and exhilaration as we work together to bring the script to life. The triplets enjoy a lighter moment in rehearsal. In addition, we have Lisa in the room who provides us insight into the playwright’s original intention and who continually gives us revisions to the scenes, improving the script at every step. Lisa is a pleasure to work with because she truly enjoys seeing the other artists discover things about the play that she hadn’t seen herself. Every member of the company is committed to making the play the best it can be, so it’s an exciting collaboration all the way around. 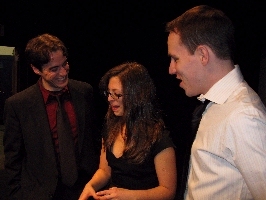 You are currently browsing the Polarity Ensemble Theatre Blog blog archives for March, 2010.